Mike Tramp (born: Michael Trempenau January 14, 1961) grew up in Vesterbro - Denmark. Still in his youth Mike Tramp loved to play soccer and discovered Hardrock. Mike Tramp joined the band Mabel with whom he later represented Denmark in the Eurovision Song Contest in 1978 with the song Boom Boom. Mabel continued in Spain where the band was very popular as a rockband. They even played a support act for Van Halen. Mike Tramp packed his bags and went to New York in 1983 With mabel but the band slowly fell apart. Vocalist Mike Tramp met guitar player Vito Bratta (ex-Dreamer) and decided to form a band. They recruited drummer Nicki Capozzi and bassist Felix Robinson (formerly of Angel) and named their band White Lion. White Lion was signed by Elektra Records in 1984 and records their debut album Fight to Survive. However, Elektra was unhappy with the final recording, and after refusing to release the album they terminated the contract. Soon after that there is some bad news. Both Capozzi and Robinson decide to leave White Lion . But sometimes bad news is in fact good news because soon the new band members are being presented: Nicki Capozzi was replaced by former Anthrax drummer Greg D Angelo, and Felix Robinson was replaced by bassist Dave Spitz (brother of Anthrax guitarist Dan Spitz). Within a month of joining, however there again is news about the band members, Dave Spitz left to play bass with Black Sabbath and was replaced by James Lomenzo The steady band line up has finally be found. White Lion is born. White Lion records Fight to Survive all over with the new band members . After that the news came that the band is picked up by RCA for a release in Japan in 1984. The small US independent label Grand Slamm records finally releases Fight To Survive in the US on November 9, 1985. White Lion released one single from this album: Broken Heart . Early in 1987 there is even better news , White Lion signs with Atlantic Records (which ironically is a sister label to Elektra) which on June 21, 1987, releases their breakthrough album Pride . All songs on this album were written by Mike Tramp and Vito Bratta . The first single, Wait was released on June 1, 1987, but did not hit the charts for nearly seven months. The Pride tour started in July 1987 as White Lion opened for Ace Frehley's 80s band Frehley's Comet. The next year and a half was filled with being constantly on tour, White Lion was opening for bands like Aerosmith, Ozzy Osbourne, Stryper, KISS and in January 1988 White Lion hits the opening slot for AC/DC on their Blow Up Your Video American tour. While being on tour with AC/DC, the Pride album and Wait single finally hits the charts, due in no small part to MTV airing the "Wait" music video in regular rotation - nearly seven months after the single's release. "Wait" hits #8 on the singles chart, while Pride hits #11 on the album charts. Pride would remain on the top 200 Billboard album charts for a full year. In August 1988, White Lion releases the second hit single from the album entitled Tell Me , which hits at #58. Around the time this single was released, White Lion plays at the Ritz club in New York City. Like Guns N' Roses , Great White and a few others before them, the White Lion show at the Ritz was filmed and later aired on MTV. The Pride album third single, a gentle acoustic ballad titled When the Children Cry , becomes the biggest of all White Lion hits at #3. with heavy MTV rotation, making Pride one of about 20 hard rock albums to ever have multiple top 10 hits and to this day the most successful White Lion album. The success of When the Children Cry would eventually push sales of Pride over the two million mark. In addition, guitarist Vito Bratta was recognized for his talents as a guitar player by racking up Best New Guitarist awards with both Guitar World magazine and Guitar For The Practicing Musician magazine and Mike Tramp was recognized in having one of the most unique voices in hardrock. In the spring of 1989, the Pride tour finally ended, but rather than take a break, White Lion instead chose to record the next album, this under pressure of the record company. A decision the band later came to regret due to the effects of fatigue from heavy touring on the final product. In August 1989, The news comes with the release of the third White Lion album Big Game , a musically eclectic follow-up to Pride that featured the singles Little Fighter , Cry for Freedom (A great song against violence, hunger and racism), and a cover of the Golden Earring song Radar Love . Big Game quickly went gold, but without a big hit single, slowly declined, with a peak of #19 on the album charts . After two years of writing and recording, there is finally some news , White Lion releases its fourth album , Mane Attraction . During the recording sessions for this album , their record company allowed White Lion to make exactly the album they wanted to. As a result, the album is the most mature of all, but, not really picked up by the label for massive promotion. Mane Attraction finally charts at #61. This may also be due to the general hardrock public's shifting tastes towards grunge, which was up and coming at that time. Terrible news stikes the bend when both Greg D Angelo and James Lomenzo decide to leave the band soon after the European tour, citing "musical differences". Mike Tramp and Vito Bratta carried on with White Lion , recruiting Tommy T-Bone Caradonna and Jimmy DeGrasso (Megadeth,Alice Cooper, Suicidal Tendencies, Y&T, Fiona). This however was the swansong for Mike tramp & Vito bratta. After briefly doing a tour in the USA in support of Mane Attraction The Final news about White Lion hits all fans worldwide in the face: Mike Tramp and Vito Bratta decide to end White Lion , their last show being held in Boston at the Channel in September 1991. The Mane Attraction USA tour was very poorly promoted in advance by the record company, while the European tour just before that was completely sold out. Unlike most bands of their genre, White Lion recorded occasional songs that addressed social or political issues such as apartheid (Cry for Freedom) and the effect of divorce on children (Broken Home). The song Little Fighter was about the Rainbow Warrior, a ship owned by the environmental group Greenpeace that was illegally destroyed by operatives of the French intelligence service. This concern for political and social issues was also hinted at in the cover art to their album Big Game, which featured a lion's head hidden in tall grass with the White House in the background. These lyrics were mostly written by Mike tramp . Mike Tramp went on to form Freak of Nature .<br>Freak of Nature releases three albums, Freak of Nature , Gathering of Freaks , and Outcasts . Freak of Nature also fell apart because of differences within the band . After Freak of Nature Mike Tramp went on as a solo artist. Tramp has released four studio albums and one live album so far; Capricorn , Recovering the Wasted Years , More To Life Than This , Songs I Left Behind and Mike Tramp & The Rock N Roll Circuz as studio albums, with Rock n' Roll Alive as his sole live album . Today, Mike Tramp continues his solo career, making albums and being often on tour . Through his website www.miketramp.dk, fans can find media from the Mike Tramp solo career, as well as White Lion & Freak of Nature . James Lomenzo joined Zakk Wylde's band Pride & Glory. Pride & Glory released one album, then James Lomenzo left the band. He went on to record and tour with ex-Van Halen frontman David Lee Roth and toured with Zakk Wylde's band Black Label Society. In February 2006, James Lomenzo joined the legendary thrash band Megadeth on a permanent basis. Greg D Angelo was the drummer for the band AntiProduct in 2006. Greg D Angelo was also filling in on drums for Britny Fox on 2007 US/European tour since their drummer Johnny Dee was unable to tour. Vito Bratta stayed briefly with Atlantic Records to help produce an album for CPR, and later tried to form a new music group that never panned out. Sadly, despite a very dedicated worldwide following of guitar aficionados, Vito Bratta was not seen or heard from publicly since 1994 until his interview by Eddie Trunk live on February 16, 2007. In 1999 Mike Tramp with new musicians released Remembering White Lion also released as The Last Roar and Ultimate White Lion which featured new versions of some of the most classic songs White Lion ever made. In 2005 Mike Tramp organized a group of talented musicians and named the act Tramp's White Lion. 'Tramp's White Lion' plays only White Lion songs, goes on tour and releases a double-live CD entitled Tramp's White Lion : Rockin' The USA. In November and December 2006, Tramp's White Lion played several dates in Europe including Sweden, Norway, Spain, Italy, Greece, Turkey, Germany, Netherlands, Belgium and Denmark. A White Lion Definitive Collection album was released in 2007. Summer of 2007 Tour featuring Tramp's White Lion opening up for Poison and Ratt was canceled after threatened legal action by Bratta caused them to be dropped by the promoter. Mike decides to change the name back to White Lion and shortly after that White Lion plays at Rocklahoma in Pryor, Ok on July 13, 2007 with Poison, Ratt, Quiet Riot, Slaughter, Y&T, among others...,. After this tramp & co also tour in the USA. Mike Tramp pushed on with the new White Lion and releases a complete new studio album entitled Return of the Pride on March 14, 2008. This was followed up by a tour which took White Lion to grounds they'd never seen before such as South America. Also a White Lion live DVD was released on December 5th, 2008 entitled, " White Lion at Bang Your Head Festival 2005 ". White Lion played in India and played to perphaps their biggest crowd after they reformed, at JN Stadium, Shillong, Meghalaya where 42,000 fans turned up to watch Mike Tramp play with White Lion. They also played to a 30,000 plus capacity crowd at the Dimapur stadium in Nagaland. White Lion was invited to India by the Current head of the Tripura Royal Family Maharaja Kirit Pradyot Deb Burman. In 2009 Mike Tramp released a new solo Album with a new band around him under the name Mike Tramp & The Rock n Roll Circuz. Mike tramp decides to spend more time in Denmark and following the Danish release of the album with a tour with his band The Rock N Roll Circuz in his country. summer 2010 Mike Tramp & The Rock n Roll Circuz headed out on tour again doing many festivals and clubs in Denmark. Mike tramp quotes that he has not forgotten his international fans and will try to tour outside Denmark in the future too. Summer 2010 Mike tramp also tells the world that recordings have been done already for a next year album release for Mike Tramp & The Rock n Roll Circuz. Mike Tramp & The Rock n Roll Ciicuz have just released their latest album on march 28 2011 entitled "Stand Your Ground". Following the Stand Your Ground album Mike tours Europe with his band. 2012 was the time for Mike Tramp to try something new so a European tour completely solo with just an acoustic guitar around his shoulder began. In 2012 Mike Tramp also started recording his new solo album "Cobblestone Street". This album is much more singer songwriter Bob Dylan style and lyrically the most personal album Mike has done so far. Mike has come to a point that he wants to connect with what he is doing very much and also with the fans that are loyal. 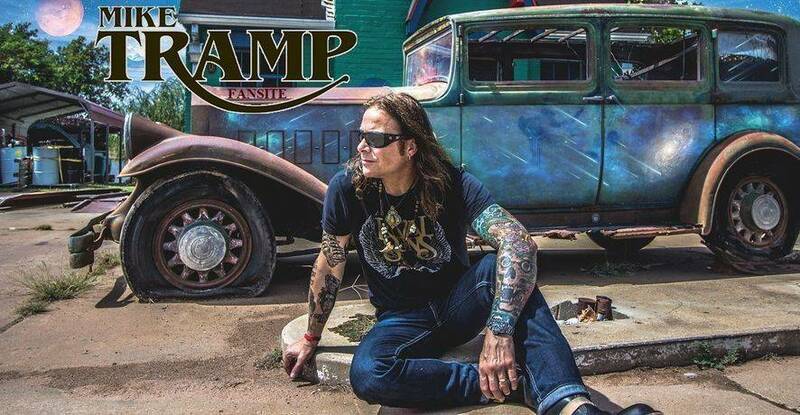 Mike Tramp is heading out on tour again all by himself, with no band to support him to bring the music naked and pure like they were originally written. In 2014 Mike Tramp again heads out to the USA to tour across several states. This time accompanied by his son Dylan. With a full new album already recorded his son directed the video shoot for the first pre album single release "Trust in Yourself". The new album "Museum" will be internationally released on August 18th" and followed up by a European tour. On this Museum Mike is expected to carry on playing the semi acoustic musical road he feels so comfortable with the last couple of years. In 2015 For the first time in his long career Mike Tramp did some shows in Russia and another endless highway USA tour. Also for the first time Mike played Canada. In August 2015 Mike Tramp released his very successful solo album Nomad, of which two songs were released as singles, both being heavily aired on Danish national radio. Mike followed up this release with a European tour with Danish new band Lucer as support and backing band. In early 2016 Mike Tramp did a lot of shows in Denmark and Scandinavia. This was followed by an extensive solo tour in USA. In 2017 Mike Tramp released two album releases. Maybe Tomorrow which has received very positive critics and is considered as his best work so far and the limited 5cd + 1 dvd boxset full of previously unreleased material including the latest single "Work it all Out" which is exclusively available on this box set only. This song is discribed my Mike Tramp as his rock anthem like "Highway to Hell" is for AC/DC. Maybe Tomorrow was followed up by a tour focusing on Denmark and Europe called Mike Tramp & Band Of Brothers which is also running deep into 2018. Upcoming album recordings have not been confirmed yet.